Script Debugger 6.0.6 – AppleScript authoring environment. Script Debugger provides everything you need to quickly and easily author AppleScripts that work. No other scripting tool can match Script Debugger’s capabilities for creating, editing and debugging AppleScripts. Its sophisticated Dictionary browser provides far more information than any other tool can and eliminates guesswork and needless experimentation. 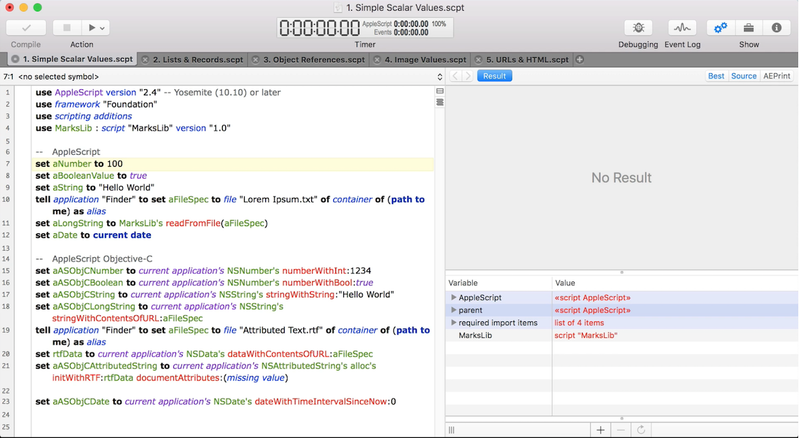 Simply put, Script Debugger makes AppleScript easy. Terminology has been updated for High Sierra (macOS 10.13). Filtering to remove heavily deprecated methods has been enhanced. Availability filtering has been expanded to cover functions, constants and enums. Where method names match variable names in a completion list, preference will be given to the method name. Enums corresponding to large numbers beyond AppleScript's integer range will now be handled more accurately when inserted as properties. To work around a bug in macOS 10.13.0, the enum NSNotFound will always be inserted as a property when using completion. When Use properties for Cocoa terms is on, enums for which numerical values are known will always be inserted as properties. Previously this would be done only if the enum was not preceded by "current application's "; now any preceding "current application's " is also deleted. Next story Home Inventory 3.7.3 – Easily inventory your possessions. Previous story PasteBox 2.1.3 – A lightweight clipboard. Script Debugger 6.0.5 – AppleScript authoring environment. FastScripts 2.6.10 – Menu item for quickly running AppleScripts. Script Debugger 7.0.4 – AppleScript authoring environment.